Which one of the Queensrÿches is this, then? Ah, the one without Geoff Tate. Right. To be frank, I've been anxious to finally listen to this album by 'the rest' of Q-rÿche. Tate did well on 'Thieves and Kings' which was released last year. He delivered a good, solid rock album. It worked for me, even if Tate's best performances are probably behind him. Even if I probably shouldn't compare the two releases and just take the present release for what it is, I can't help it. 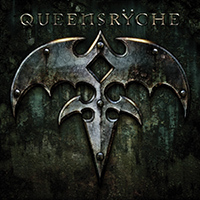 The other Queensrÿche (i.e. Rockenfield, Wilton, Jackson, Lundgren and new singer Todd La Torre) have, in my best judgment, outdone their former singer with their first album with Torre behind the microphone. 'Queensrÿche' is just more on all accounts. It's more daring, it's heavier (without losing the ballady songs which Q-rÿche always did so well) and it simply has the better songs. I've spent quite a lot of time with this album over the past couple of weeks, enjoying it more and more. I wouldn't say it's a leap back to the earliest albums as some have claimed, but if you land somewhere between 'Empire' and 'Promised Land', you're probably not too far off. For me this is good news! Next to 'Operation', 'Promised Land' always was my favourite, and then 'Empire' in on a third. 'How about Torre?' you ask. In some instances, it's as if Tate is there. Scary - but at the same time wonderful. He sounds like a younger and more daring Geoff Tate, and that's just great. He also manages to sound like more than just a Tate clone, which, I reckon, is what makes it even cooler. Queensrÿche couldn't have found a better replacement. The conclusion is that Queensrÿche (this version) is definitely revitalized and apparently ready to make relevant contributions to the metal community again. Hooray for that!